The Elysian fields, final resting place in Classical mythology for the virtuous and heroic, must surely be filled with chamomile. The hypnotic smell, the bright, joyful faces of the flowers, the gentle breeze and humming of insects, all combine to convince you that you have reached paradise. 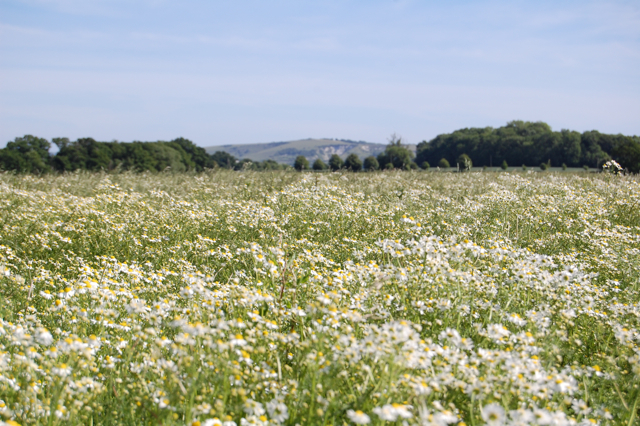 Many meetings with plants have the ability to transport you to a place of wonder but, for me, sitting in a field of german chamomile (Matricaria recutita) stretching as far as the eye can see, is one of the most enchanting of all. 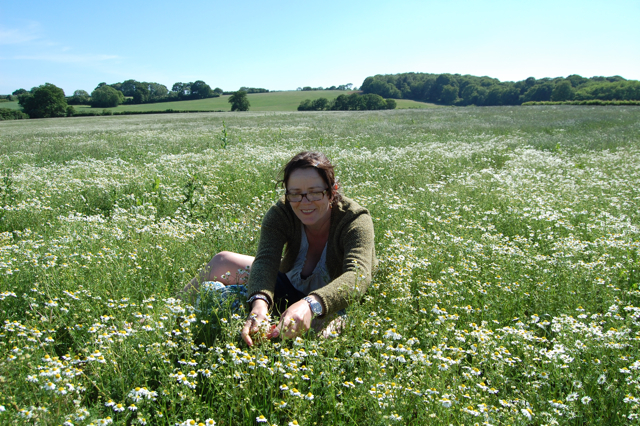 A short while harvesting or relaxing in fields of chamomile is enough to wash away all the drudgery, all the dreariness, all the uncomfortable intensity of city life. I believe (at least during my more optimistic moments!) that one day people will become attuned enough to the subtleties of their senses that healing and medicine will consist of just sitting amongst the plants, without having to ingest or apply them to get all the benefits they need. 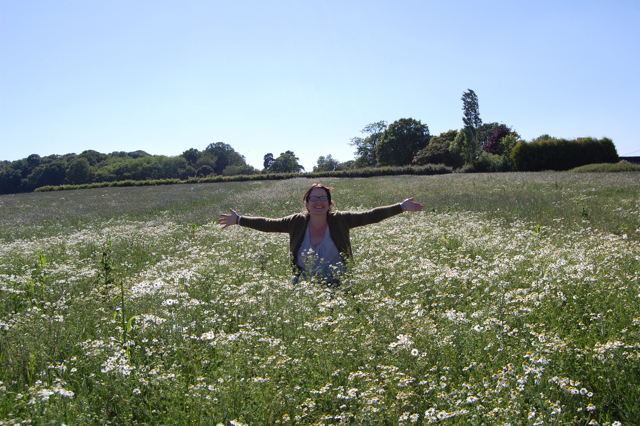 I feel this strongly when sitting with the chamomile, which is a favourite plant ally of mine, with its joy and unparalleled generosity beaming all around me. 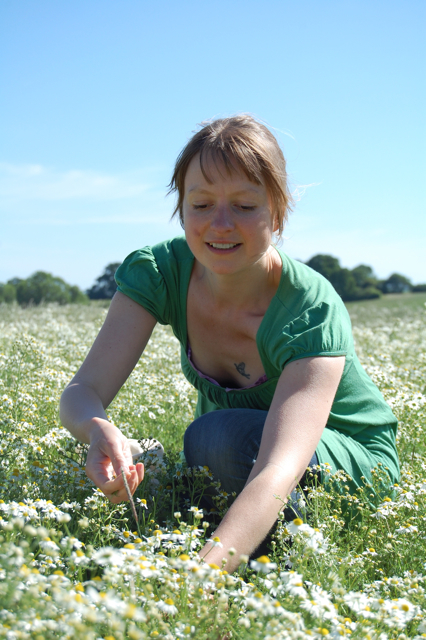 I spent a lovely afternoon harvesting with my friend and brilliant herbalist Therri who was collecting enough chamomile to supply herself and various other herbalists she makes tinctures for. After gathering enough for litres and litres, we had hardly made a dent. It wasn’t long before the bliss was too much to contain! After no time at all I had collected plenty for making up some goodies- enough tincture for my needs, a good quantity of infused oil, a little treat of infused honey and lots of flowers for drying. Chamomile honey and tincture in vodka. The tincture only needs about a week to infuse and, after straining it a couple of days ago, I can confirm it’s one of the best chamomile tinctures I’ve tasted. Flowers often need less time to infuse than thicker leaves, stems, woody parts or roots and even less when they are tinctured fresh. 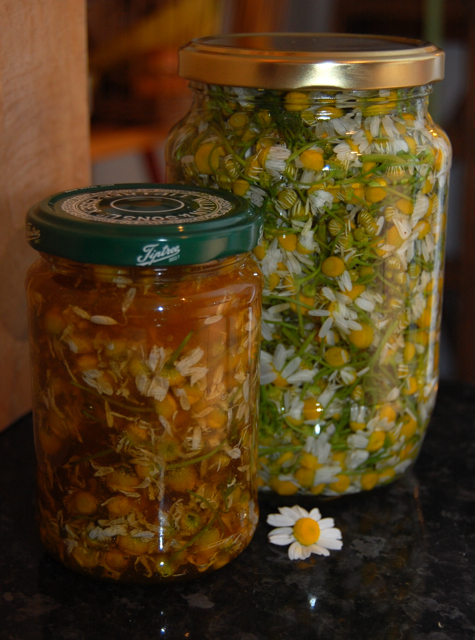 Brigitte suggested a chamomile honey in her comment on my post on uses for dried chamomile a while ago. I’ve been hanging on for the fresh to make this as, though they can make the honey a bit runnier because of the moisture content, I often prefer the flavour of honeys infused with fresh herbs, at least where their use is appropriate. For the oil I used an organic apricot kernel as it is particularly suited to sensitive skins. After a week’s sun infusion it has turned out beautifully, the smell is unbelievably strong and the colour has turned a deep green due to the anti-inflammatory component, azulene, which occurs in the volatile oil of the chamomile. I’ll be using this oil to make a soothing skin cream with calendula infused oil and a healing massage oil for nervous tension with linden and St. Johns wort infused oils. Chamomile in Apricot Kernel oil, sun infusion. 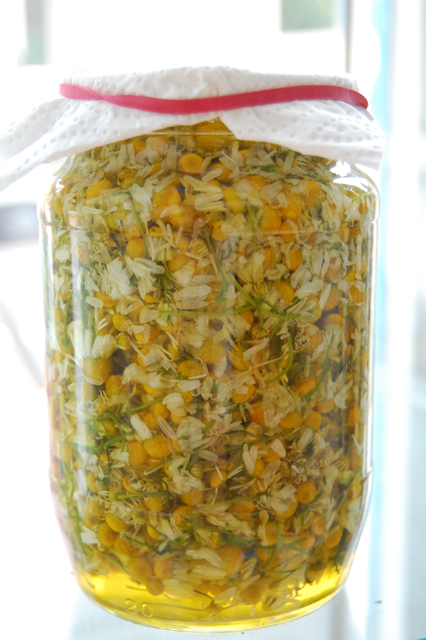 I’ve dried enough to keep me going for the year and make up my favourite chamomile tea blends. 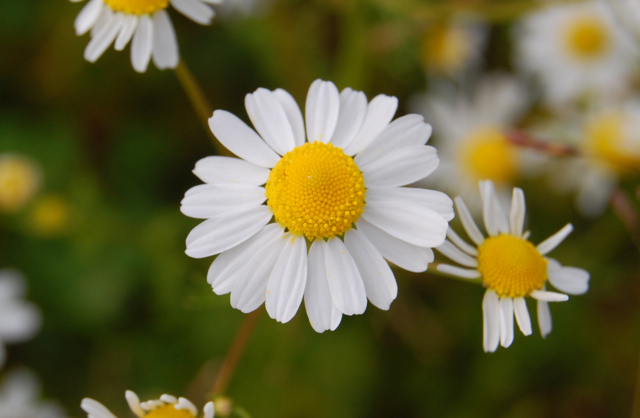 Chamomile is useful for so many ailments and so many people can benefit from spending time with it. I’ll post a full monograph soon to outline some more of it’s traditional and modern uses. Thank you for visiting my blog and your very beautiful comment. 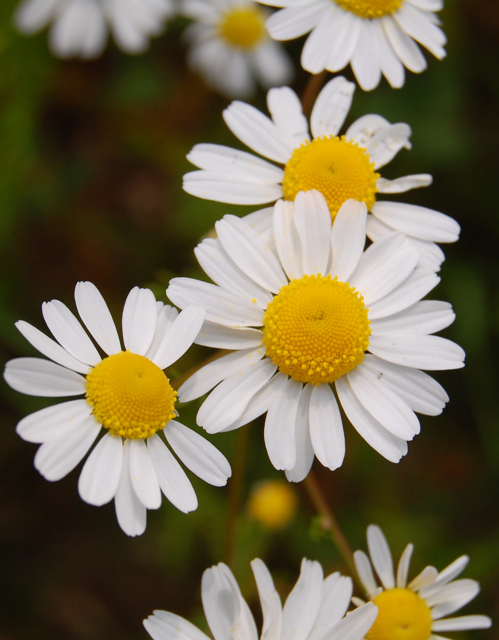 Chamomile is one of my favourite herbs. I grow it in my garden along with thyme, lavender, borage and much more. I use plants from my garden to heal and restore. 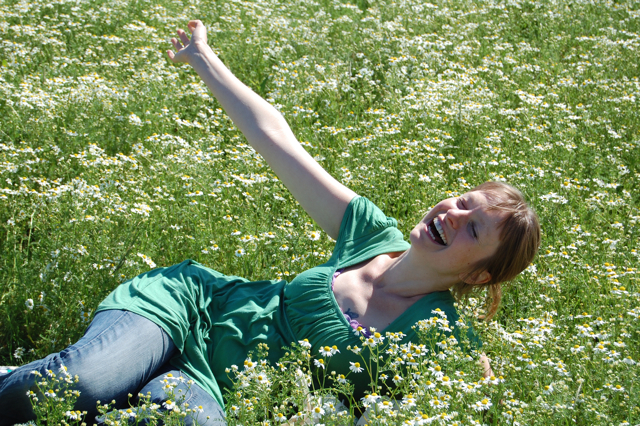 Being with nature is healing, to sit amongst chamomile must be just a most lovely experience. 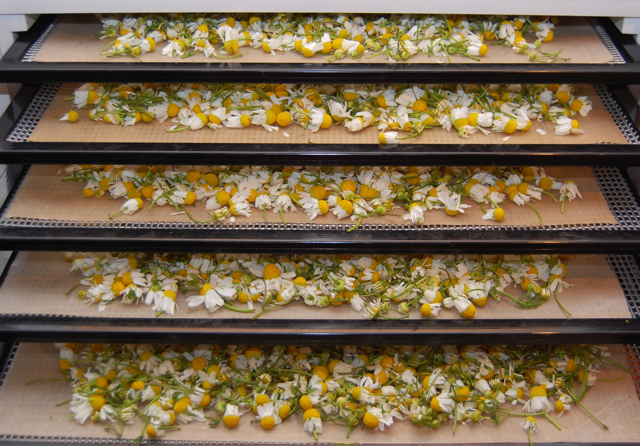 I love the image of the flowers drying…..so pretty. Thanks Cheryl, I’ve been a fan of ‘my garden sanctuary’ for a while and am enjoying your new blog too. Such wonderful photos you take. I always feel your garden is alive with the fae. hi lucinda, im gutted to see that the eldereflowers only made an appearence for like 1-2 weeks this year and now they’ve all gone brown! my grandad says its because its been so dry and no rain!! im gutted! I’m sorry you missed the elderflowers. A lot of things are coming and going quickly at the moment, being late from the cold winter then coming up all at once with this hot, dry spell.